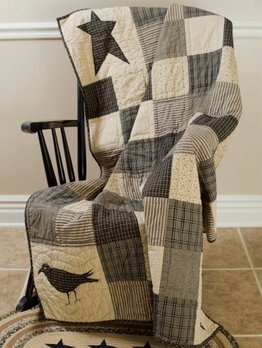 The Kettle Grove Crow & Star brings a primitive statement to any room with its assorted patchwork blocks in creme, black & tan.The 50" x 60" throw features primitive stars & country crows on all four corners. Reverses to black, tan & dark creme. Bring the finishing touch of the Kettle Grove Woven Throw to your home. 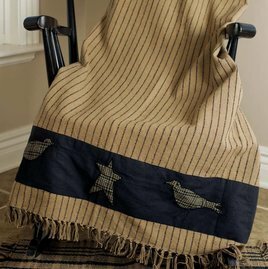 This throw is 100% cotton with a patchwork strip of crows & stars at one end & finished with tassels at both ends. Measures 60" x 50". The Kettle Grove Bed Skirt brings a rich base to the beautifully patterned, random, 5" block with woven plaids, stripes and prints of the Kettle Grove Bedding Collection by VHC Brands, Cotton. Machine Washable. 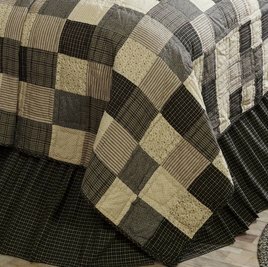 You'll love the Kettle Grove Quilt with random 5" patchwork blocks in woven plaids, woven stripes & prints. Quilt has a 100% cotton shell & fill. Machine pieced and hand-quilted in echo stitching. Machine wash, gentle cycle.